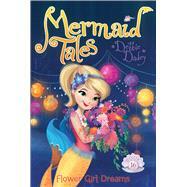 Underwater wedding bells are ringing as Mr. Fangtooth gets ready to marry his sweetheart in this sparkling Mermaid Tales adventure. Pearl can’t believe that grumpy cafeteria worker Mr. Fangtooth is marrying Lillian the librarian. She doesn’t understand why Lillian would want to marry someone who is always so grouchy. And she’s even more shell-shocked to discover that Echo, Shelly, and Kiki are going to be flower girls at the wedding! Pearl is tail-flipping mad—why wouldn’t Mr. Fangtooth and Lillian invite her to be a part of the ceremony too?! Pearl makes up her mind: One way or another, she is going to be in that wedding too. She decides she will prove that she’s the perfect flower girl by taking over the wedding planning—with disastrous, expensive results! Can Pearl clean up her mess and make sure that Lillian and Mr. Fangtooth have a happily ever after after all?